The ceramics came first. Last summer I happened upon a friendly neighbour who mentioned that her former-almost-daughter-in-law was involved in setting up an earthy new local venture. Former-Almost had apparently joined forces with like-minded artists to create a ceramics studio within some railway arches in nearby Haggerston. Turning Earth is contemporary not just by way of construction, but also in concept as its flexible facilities welcome the beginner, the amateur and the professional potter alike. The idea of getting down and dirty with clay somehow appealed, a welcome distraction from the graft of growing my own business. I explored and enrolled with younger daughter, The Exocet. A few short weeks later, Exocet and I were working cheek by jowl on the Beginners Course within this marvellous enterprise. Exocet demonstrated an innate understanding of the material in hand. She produced shapely pieces on the wheel; her coil pot was nothing less than accomplished. My own talent came by way of nurture rather than nature with ever patient Stuart-the-Tutor gently encouraging my efforts into recognisable form. An initial wheel-thrown piece was reduced to an eggcup by the time I had finished squeezing its curves; my coil pot required first aid on the wheel. 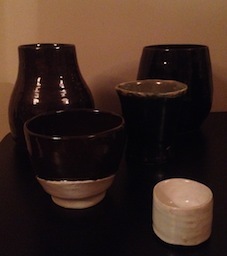 Things improved slowly but surely and the five-week course yielded a tiny galaxy of pretty pots produced by my progeny and I, of which we are rightly proud. Most importantly of all, Mother and Daughter emerged from every two and a half hour session glowing like a couple of Ready-Brek Kids. Another RBK event arrived just before Christmas. Having listened to wistful memories of my piano playing days and an apparent desire to tinkle the ivories once again, BB (blogs passim) arranged delivery of a Casio keyboard, stand and stool. Too big to fit under our tiny tree, this jauntily illustrated pack sat conspicuously in the kitchen until three days before Christmas when Piano was unpacked. We found a home for her in the sitting room and she was settled right there. Then the fear set in. Piano and I observed each other. I sat with her and fidgeted. I stared at her keys, which would not speak to me. I attempted a scale or two. It became abundantly clear that my six piano grades (including five of theory) were long gone. Having summoned Piano into my life, I knew not what to do with her. Back from the New Year break I found that whilst at home, Piano’s stare followed me. I avoided her. I listened to music, watched endless detectives on telly, read newspapers in bed; but still Piano was able to peep upstairs, round corners and find me. It seemed however, that her looks were becoming less accusatory, more cheeky. Perhaps? Perhaps. A little seduced, I sat with her again to try scales and simple tunes. Yes, maybe I could do this after all. Didn’t I have someone helpful in my address book? A scroll through to find the Piano Tuner from days gone by led instead to Barnaby Green, a highly accomplished musician I knew from those very same days. Barney is also a composer. He plays regular sold-out gigs. It transpires that he teaches within Hackney and lives not a mile away. Who can resist such serendipity? Barney has accepted the challenge to turn a grown woman’s musical ineptitude into something that might make the heart sing. He spends an hour a week with me, tutoring, nurturing, encouraging, bollocking. I practice daily. After half an hour I allow myself a glass of wine, only to be sipped when a set of scales or a piece is right. Tonight I got through two glasses. After the dispensing of new work, I suspect it will reduce to a half. Piano and I are getting along famously now; in fact, I can hardly wait to conspire with her at the end of each day. My fingers become itchy; I thrum scales on my desk and in my head. BB has, through Piano, given me an unexpected new love and I am happy. Less happy was I last November when bereavement and persistent ill-health conspired to run me down to levels so low I could barely leave my bed for a month. During the most traumatic days of loss I vowed to pick myself up and somehow shape up, to manage life’s future challenges a little better. Two days after my Mothers’ funeral, unwell and far from ready for anything new I walked into the very local Moss Pilates and faced a stranger. “Are you alright?” enquired the concerned Helen. An unexpected question that released clumsily contained grief. “My Mother has just died.” Calm, sympathy and kindness prevailed. “You’ve come to the right place,” she said and after some mopping up, I was shown around this lovely, shining temple to Pilates. For approaching three months now, three times a week I cycle there at lunchtime and take part in relentless, reviving and oddly relaxing Reformer classes. My teachers are diligent, thorough, friendly, funny and reassuringly super-fit. My walk is more erect, my limbs stronger, my back pain-free, my abs far ‘abbier and for the first time in many months I’m feeling fine. This tale gentle reader, is told to reassure you that coming over all fingers, thumbs and limbs is not just better than good, it is wonderful. I can recommend it all. This entry was posted in Art, Family, Feminism, Friends, Health, Life and romance, London, Uncategorized and tagged Barnaby Green, Ceramics, classes, Crowdfunding, London, Moss Pilates, piano, Pilates, Turning Earth. Bookmark the permalink. Inspirational…your Mum would so approve and be so proud! I’ll vote for it! Hope you and yours are all keeping well. See you soon, somewhere……. So pleased to hear you are tickling the ivories again after all these years. Giovanna and her Joanna!